because I really don't want anyone to feel discouraged. it really does show how a bit of dedicated time will get things done. I've made six giant 24" cushions and four 18" cushions for our lounge. Most useful thing I've made this year I think. Used all the time by the kiddies. 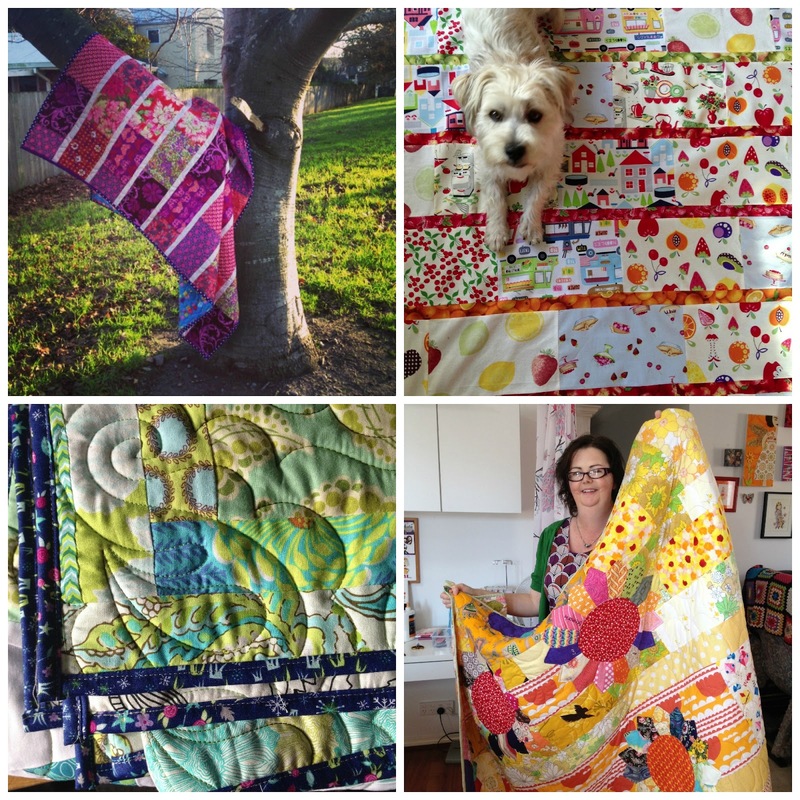 Four little quilts for little people. Three of these were swaps and one was a commission. and one for Dee from those of us who love her! 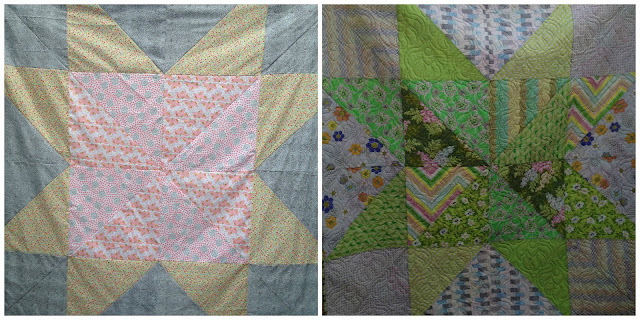 Two raffles quilts, one for Class 5 at Rudolf Steiner School and one for Independence Games. I think 23 pillowcases. I've got these down to a fine art now! 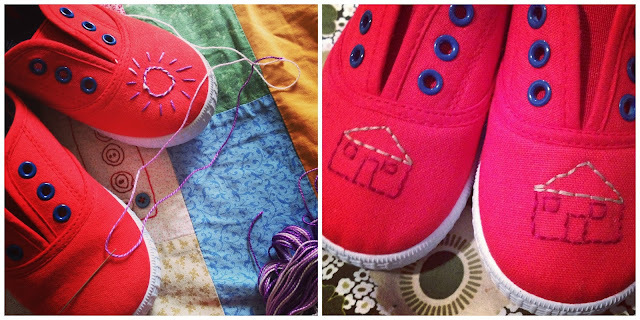 Embroidered two pairs of shoes for Annie and her friend. 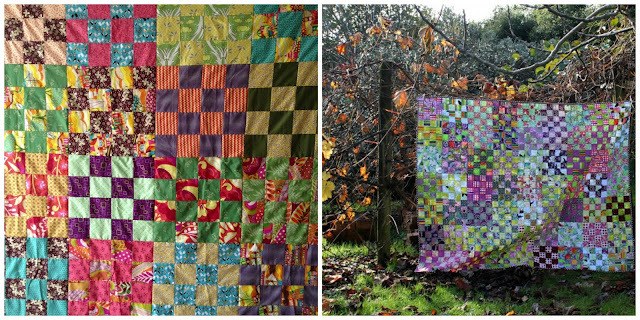 and a bright and cheerful quilt for Cam. a wall hanging commisioned (2.8 x 2.2m) and a kantha quilt for the caravan. mended four pairs of jeans and altered two pairs of curtains. Please don't hate me. I just plod away getting things done. Some of these things took no time, some of them were almost done before the year began. Maybe I'm a bit obsessed, I hate sitting doing nothing. I think I might go and have a little lie down now! Holy Moly. There is no way I can get up in the morning to sew. I want to sew more but by the time it gets to night time I am done. And you study too!!! How could anyone hate you, ever!! You are an inspiration, utterly utterly utterly!!! "not all of us can do great things. but we can do small things with great love" Mother Teresa. That's a lot of love and beauty you have given others. That amounts to a great (awesome, inspiring, wonderful, ...) thing. 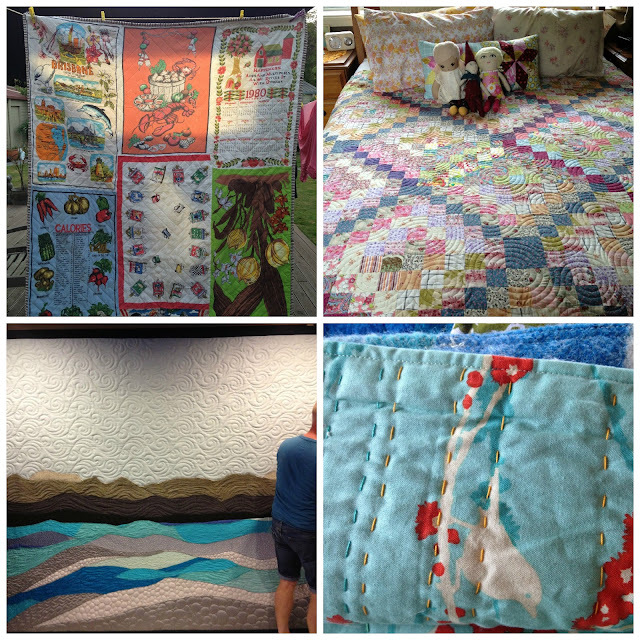 I love my quilt and have spent quite a bit of quiet time snuggled under it .. .. ..
Wow Deb, you're a STAR!!! Could never never hate anyone with such a big heart as you've got! Fantastic! I'm sure all that sewing did wonders in the stress department! I hope 2013 is just as productive for you. thanks for the encouragement, truly! morning is my favorite time to sew too. I dont always get the time in but after seeing this i think i will work a little harder at making it happen. I agree thats a lot of love you stitched up there! I had to come back and have another look this morning. WOW- I need to get off the computer and onto the sewing machine!!! You're a legend. Good on you for making the time to do something you love. I could probably achieve more if I got up earlier too. Omigosh, it's only June!! Shift over, nudge nudge, you've made me tired just reading about it! Wonderful! I get it, as sewing is a way for me to keep my sanity too. No hating here! DEB! AWESOME! Your productivity is inspiring! 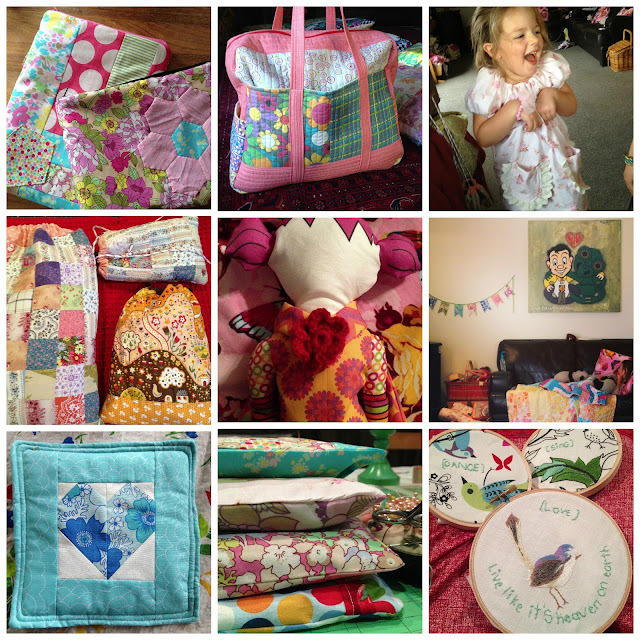 And I love that you've included other crafts in here, theres knitting and embriodery too! Beautiful. Just wow! I am SOOOOOOOOO very, very, very impressed!!!!! Well done! That is amazing! I know I always pester you on IG....you said you are useless in the evenings....so do you go to bed at like 9pm? I am currently setting my alarm for 5:30am with the hope to be out of bed by 6am then shower, breakfast, read my Bible. The time FLIES and then by 7am or 7:30am if I am lucky I am zooming through the day busy with the kids. I crash and burn by 8pm and waste all spare minutes on ig as they are literally minutes and it is when I breastfeed. Ugh! I am really impressed and so want to work out how I can be more productive! Deb, you are an INSPIRATION!!! Gorgeous finishes! Its great that you have documented them. I have been making pillowcases for gifts too. How satisfying they are. I much prefer using them now for my family. It warms my fabric loving heart.